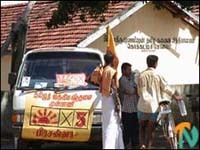 Two Tamil National Alliance candidates for Batticaloa, Indrakumar Prasanna and A.Selvendran, Monday canvassed in the Paduvankarai region of the eastern district which is under the control of the Liberation Tigers. Police at the Paddiruppu Bridge, the main entry point to the large LTTE held hinterland of the Batticaloa district, let the candidates travel in their campaign vehicles for the canvassing. 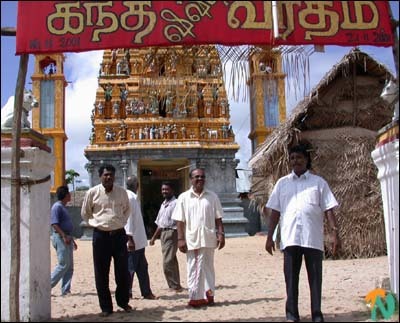 Selvendran and Prasanna addressed a 'pocket' meeting near the Kokkaddicholai temple and distributed campaign literature in the villages of Arasaditheevu, Ambilaanthiurai, Kadukkamunai, Porathivu etc., Indrakumar Prasanna is the deputy leader of the Tamil Eelam Liberation Organisation (TELO). "We are not contesting this election to adorn the chairs of the Sri Lankan Parliament like the misguided Tamil quislings who collaborate with the Sinhala chauvinist regime in Colombo. The Parliament is merely a forum for us to tell the world that we shall never surrender our people's right to self-determination and the indivisibility of the land of our birth, come what come may". "The Tamil National Alliance will continue its democratic struggle for the unity of our people and our right to self-determination even after the elections. I think that soon even the Tamil lackeys of the Sri Lankan government will see the truth and join our cause. We will forget the past and welcome them into our alliance to defeat the divide and rule strategy of our nationís enemies", Mr. Prasanna said, addressing 'pocket' meeting in Kokkaddicholai.